I'm slowly, but surely getting the apartment decorated. It takes me awhile to put things on walls and find just the right place and choose what I want to put there. Having an apartment makes it more of a challenge. The walls aren't mine to make as many holes as I please so again creativity comes into play. As some of you know in my old house I had an old ladder that served as the railing to the basement. That ladder was so long that to make it into a railing I had to cut off a section of the ladder. I couldn't bring the railing with me, but the extra section went on to the truck and it's found a special place in the new home. 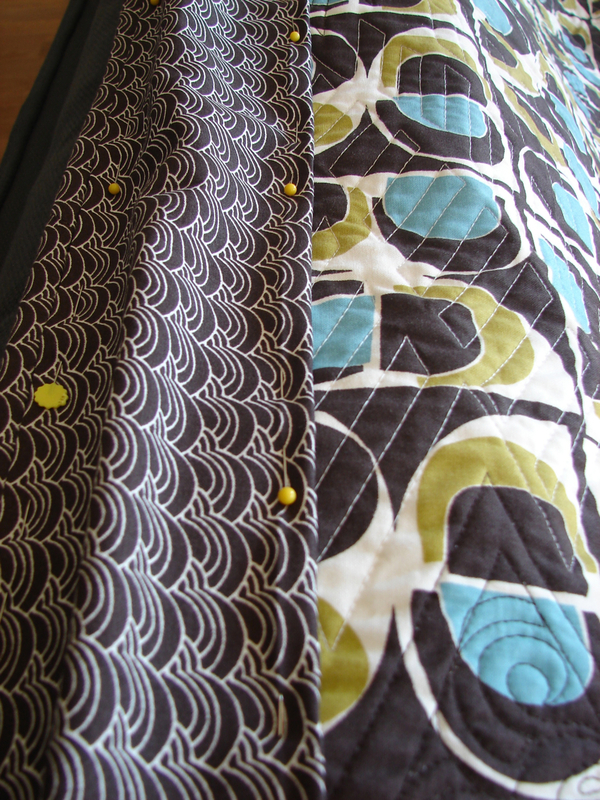 I finally finished sewing the binding on this quilt and I love how it looks hanging on the ladder. I only have one bed now, so quilts on beds aren't an option. 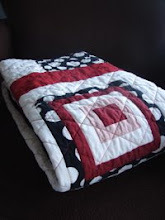 I do have wall space though, so more quilts will find their way onto walls. They're art whether they are on beds, walls, chairs, or hung on a ladder! In order to hang quilts I need to make some sleeves. 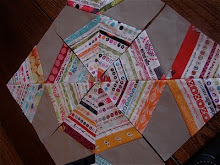 I need to hand sew this and then on to the wall it goes. I'm trying to create a hallway gallery. We'll see how that goes. One little tip today: I've discovered the joy of Command hooks. Easy peasy and no holes in the walls! Genius! In my small space having things right where I need them helps me work. I hung my scissors right above the ironing board. Seems like a small thing, but they're right at hand, no searching and I use them at the ironing board all the time. Command hooks are amazing for hanging everything! 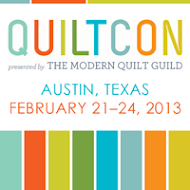 Quilts too!! Can't believe it's Friday. Enjoy your weekend and don't forget to take a few minutes to take the Modern Quilt Guild survey. Big things are in the works and we want you to be a part of it! 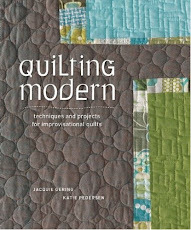 PS: The winner of the Quilt Retro book is Carla G. Send me your contact info and Jenifer will send you your book. Congratulations! 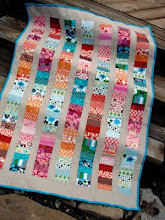 The quilt and ladder look so beautiful there. It's fun to imagine you settling into life in Chicago....but we missed you last night!! Have fun with the art! I'm sad that you don't provide a full feed for your fabulous blog. I just get a few opening lines in my Google Reader. Is that on purpose? Looking great so far! How do you add your hanging sleeves? 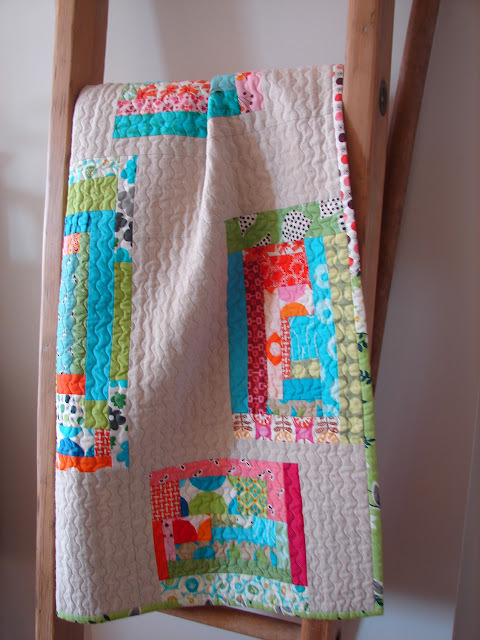 would you be able to tell me what the solid used for the background of the quilt on the ladder is? Do you like your iron? I'm looking for a new one and yours looks interesting? 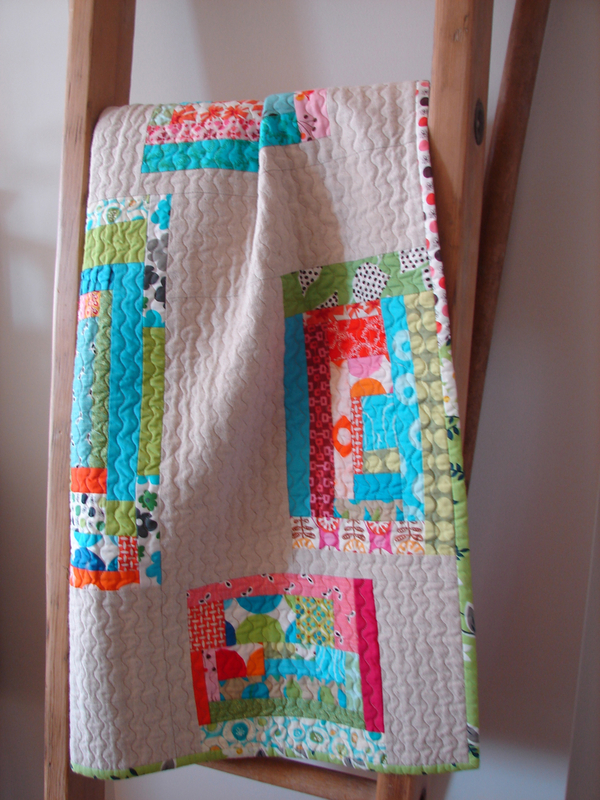 Love the quilt and the ladder. 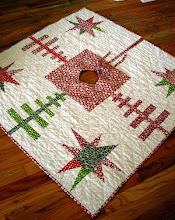 Love love the quilting on the quilt. Envying your solid stash:) a bit. Leah Day was talking about the 3M wall holder things (similar to Command) on a blog post today. Your apartment must be starting to feel like "home," now that you are getting some of your things close by and out where you can see them. I keep meaning to tell you that our Sunday paper arts and entertainment section had an article on the Tallgrass Prairie Museum. It was quite an extensive article--very interesting. Ahh... Command hook brilliance! I use them for other things but I never thought about scissors. 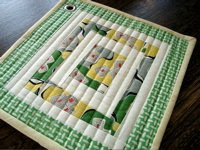 Love the quilt ladder too! 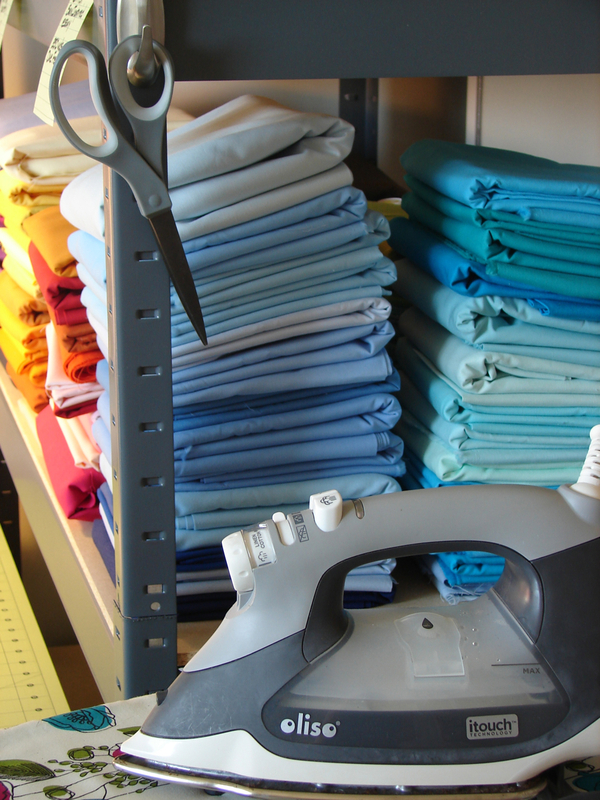 I love Command hooks too...I have my rulers hanging from them near my cutting table. Love that quilt hanging on the ladder, looks great! 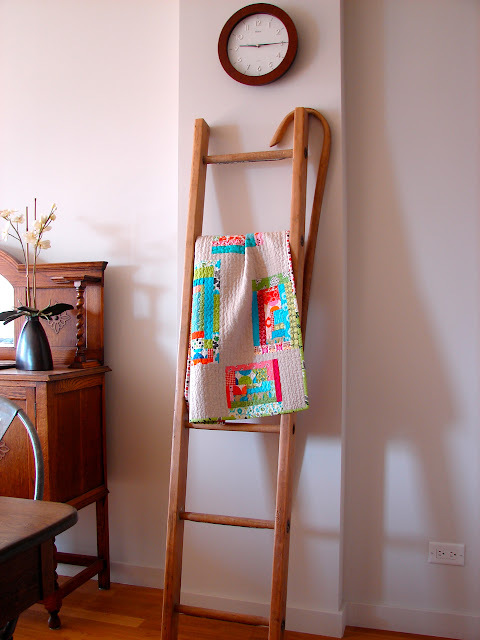 the ladder and quilt are beautiful..love the modern with the old look. 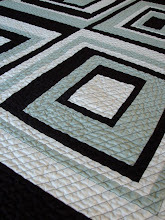 That squiggly line quilting is breathtaking...I just gave it a try and mine is a disaster. 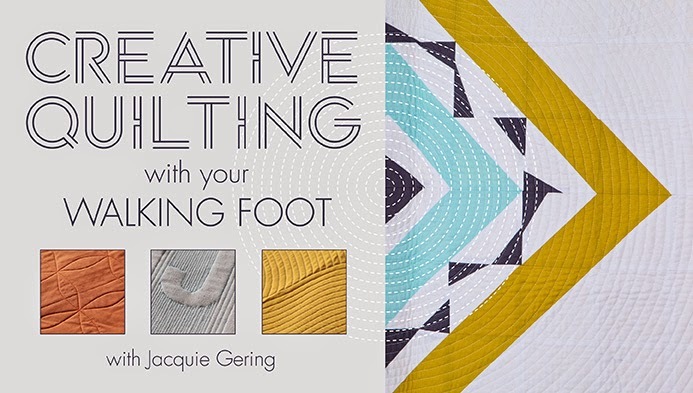 Did you do it free motion or just move your regular quilting foot around? So so striking...love it.